Bali is a masterpiece of Gods because there are many beautiful places in Bali like Kintamani and Penglipuran village. Kintamani is one of Bali's tourist options as well. Kintamani is located in Bangli district and famous for the beauty of the mountain Batur. Unlike other mountain in the world, then you can see the peak of Mount Batur from the top of the hill while eating at a restaurant in Kintamani. Mount Batur has erupted several years ago. In this mountain there is a beautiful lake, also called Lake Batur. In the vicinity of Lake Batur is a traditional Balinese village called Village Trunyan who still maintain the tradition in the modern world. You will discover that the beauty of Kintamani more complete because there are several historic and ancient temples. Kintamani is a very unique place in Bali. The view, the temples, the tradition are different than other places in Bali. 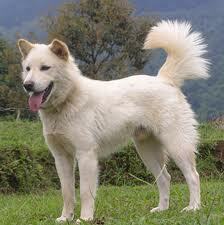 If you are a dog fan, do not forget to see the Kintamani dog with beautiful feathers. Native Dog Kintamani very unique compared to other dogs in Bali or other countries. If you have not had time to Bali and are interested to have the Kintamani dog, try to find information in the pet store in your town. You’ll really like this dog because it has high intelligence and easily trained to follow the orders of their owners. I love Kintamani because of the view and friendly people and weather. The Temperature in Kintamani is much cooler than other resorts in Bali, with temperatures about 18 degrees Celsius, will surely give its own ambience during a holiday in Bali. While enjoying the lunch meal, you can enjoy the beauty of the lake and mountain Batur, Bali's second highest mountain after Mount Agung at Besakih temple. 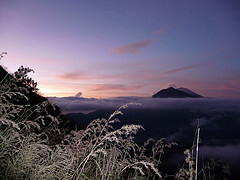 Activities you can do in Kintamani is to climb Mount Batur at dawn. You will get incredible views of sunrise from the summit of Mount Batur. Once you come down from the top, enjoy the beauty of Lake Batur. You can breathe the most clean and fresh air in the world. You will earn a peace of mind, body and soul. There are beautiful hotels and villas in Kintamani and Lake Batur, so you can enjoy most of the Balinese ambiance during your visit in Bali.